Lake Country Christian High School is a Christian College Preparatory Academy. Our goal is to prepare our students to be Christian leaders as a part of a successful college experience and beyond. There are many opportunities that are available to further this endeavor. As a college preparatory academy, Lake Country Christian High School follows the state’s diploma requirements. All graduates earn a High School Foundation Diploma plus the Multidisciplinary Endorsement & Distinguished Level of Achievement. Additional endorsements can be earned. Lake Country Christian High School utilizes a Block Schedule. 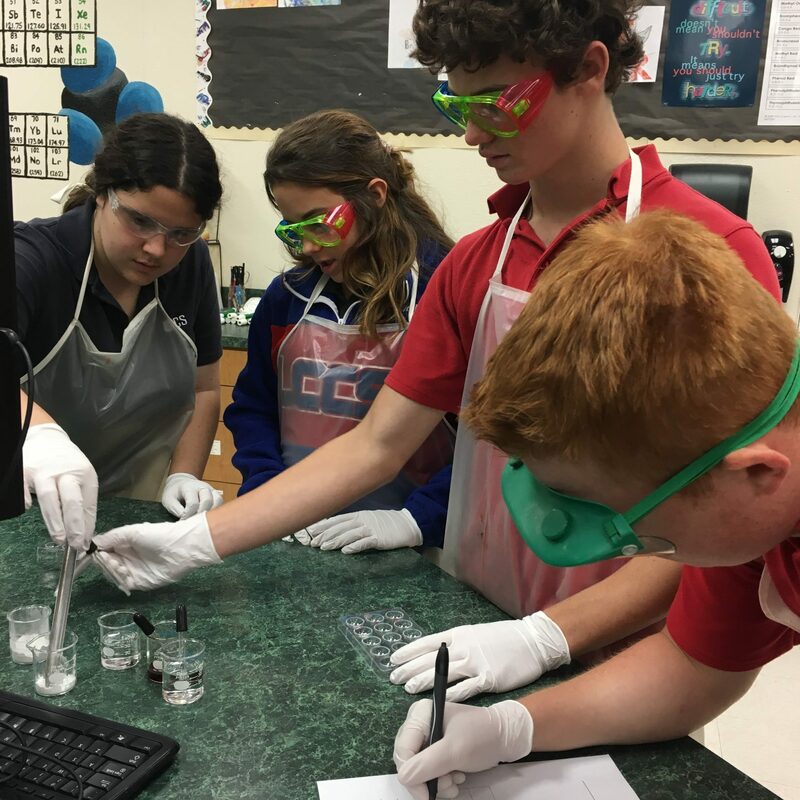 As you progress through your educational experience, life at Lake Country Christian High School is enriched through extracurricular opportunities. The House System: The purpose of the House system is to provide a means of building unity, loyalty, and tradition through the high school over an extended period of time. It is designed to encourage and increase competition among the students, and to create a supportive environment. It also provides leadership opportunities. It originated in British boarding schools where students actually lived in “house” units. The LCCS Houses are named after persons with founding connections to the school. The names for the houses at Lake Country are Blanton, Byers, McElreath, and Mauldin. Each House has distinguishing character qualities, a color, and an animal symbol. The LCCS High School student body is divided into four mixed gender mixed grade level groups. All members of the same family are placed in the same house. The Houses do not replace grouping students by grade level for Pep Rallies and other traditional events. YMCA Texas Youth and Government: The Y & G Program allows students to participate in mock government activities in a competitive scholastic setting. Whether serving in the legislature, senate, courts, or media students gain political awareness and improve their communication skills through speaking and debating issues. LCCS students attend the district conference held in Fort Worth and the state conference in Austin. LCCS students are frequently selected as distinguished delegates on the state level. LCCS students have been elected as state officers and Youth Governors. LCCS students have served as state delegates for the Conference on National Affairs in North Carolina. 4-H: Texas 4-H prepares young people to step up to the challenges in their communities and the world. Head, Heart, Hands, and Health are the four Hs in 4-H, and they are the four values members work on through fun and engaging programs. These programs provide 4-H youth the hands-on real-world experience they need to develop into leaders. Student Council: The LCCS Student Council provides students the opportunity to participate in a representative governing body at an appropriate level for upper school students. Student Council members provide input, organize, coordinate, and carry out plans for special events throughout the year including New Student Orientation, Open House, Spirit Week, Love Your Neighbor Week, Homecoming, and Spring Formal. Senior Reps – Marina Siratt, and Brinley Kilpatrick. Sophomore Reps – Emma Hunsucker, Tyler Vance, and Dayne Love. Freshman Reps – Case Carroll, Kaitlyn Gamez, and Eli Purtell. Lake Country Christian High School is an extension of the Christian home and local church. We are committed to providing opportunities for students to come to faith in Christ, to teach them who they are in him and to grow in a real relationship with God. Bible classes, chapels, retreats, biblically integrated academic instruction and relationships with other students, teachers, and administrators whose lives reflect Christ help students to love God and want to know him better. Lake Country Christian High School is committed to missions. Acts 1:8 commands us to be witnesses in Jerusalem (Fort Worth), Judea (Texas), Samaria (Mexico), and the uttermost parts of the earth (overseas). Our desire is to give students an opportunity to fulfill these verses and to see the purposes of God revealed. We feel very strongly that students learn early on the importance of giving back to the community and sharing God’s love with others on a practical level. High school students are encouraged to serve locally or through domestic and international mission trips. High school students have traveled with LCCS to Galveston, Arizona, Missouri, Colorado, New York, El Paso/Juarez, Honduras, Spain, Dominican Republic, Thailand, Peru, Argentina, Panama, Romania, Scotland, Germany, India, Turkey, England, South Africa, Czech Republic, El Salvador, and Italy to serve through building projects, disaster recovery, feeding the poor, working with schools/orphanages/medical clinics, evangelism, intercession, and outreach through the arts or sports and cultural exchanges. Throughout the year students come together to plan, gather needed resources, and provide support for community-based organizations such as Beautiful Feet Ministries, Tarrant Area Food Bank, Union Gospel Mission, Life Unlimited Ministries, and Saginaw’s Community Link Mission. High School Mission Days are designated each spring to provide an opportunity for students to serve together at local community-based organizations.